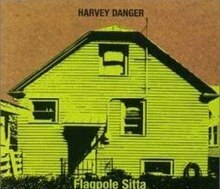 Harvey Danger was an American indie rock band that formed in Seattle, Washington in 1993, and rose to prominence in 1998 with the single "Flagpole Sitta", which is also used as the theme tune to the British sitcom "Peep Show". On August 29, 2009, the band played its final show at the Crocodile Cafe in Seattle. The band's debut album, Where have all the merrymakers gone?, has sold over 500,000 copies, with "Flagpole Sitta" still receiving regular airplay around the world. On July 29, 2014, 17 years to the day after its initial release, Where have all the merrymakers gone? was re-released on vinyl as an LP by the independent record label No Sleep Records. Comedy site CollegeHumor also made a lip dub of their employees singing the song. The song was featured in the TV series October Road episode, "Best Friend Windows." It was also featured on the TV series Psych on the episode "Tuesday the 17th." Most recently, the American version of The Office performed an homage to the CollegeHumor lip dub for its cold open. "Weird Al" Yankovic used the chorus of the song in his polka medley, "Polka Power! ", on his 1999 album, Running with Scissors. Chiodos have also covered this song on the album Punk Goes Pop 2. American alt-country band Deer Tick performed a version of the song in July 2012 for The A.V. Club's A.V. Undercover series. The first part of the song was used in various title sequences in the British satire show "Russell Howard's Good News".